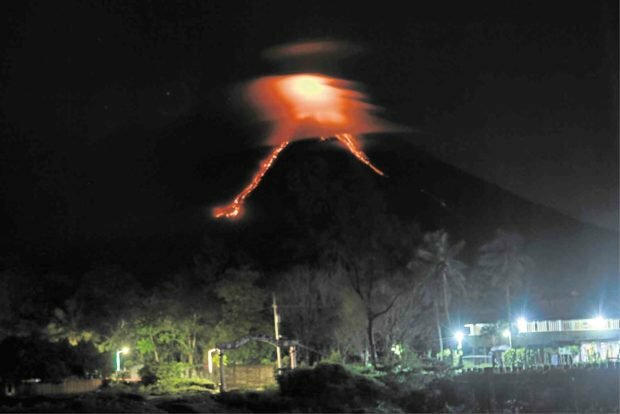 LEGAZPI CITY — Volcanologists warned on Monday of a possible hazardous eruption of Mt. Mayon in Albay province "within weeks or even within days," as magma continued to pile up at its summit. Amid the looming threat, the number of evacuated people rose to 15,410 in the towns of Camalig, Guinobatan and Malilipot, and in the cities of Tabaco and Ligao, reports from local governments and disaster response agencies showed. The provincial government on Monday started discussion to place Albay under a state of calamity. On Sunday night, the Philippine Institute of Volcanology and Seismology (Phivolcs) raised Alert Level 3 over Mayon after observations noted lava flow. "There is an increasing tendency toward a hazardous volcanic eruption — with pyroclastic flow," Phivolcs Director Renato Solidum said in a telephone interview. "We are monitoring it for the possible hazardous eruption within days or weeks." Solidum said the lava dome, which was formed at the crater in 2014, caused the intense lava flow on Sunday night. "In 2014, lava was flowing slowly so a dome formed at the crater. On Saturday, lava flow punctured through the dome formed in 2014 so an intense lava flow happened on Sunday night," he added. The agency will raise Alert Level 4 if there is an indication of hazardous explosion with "lava fountaining," Solidum said. Level 5 indicates an eruption is in progress. "That will be based on the high gas content and the [frequency of] recorded tremors," said the chief volcanologist. Ed Laguerta, Phivolcs resident volcanologist here, said the lava dome collapsed at 9 a.m. on Monday, generating pyroclastic flow that led to ashfall in Guinobatan and Camalig towns. "The cause of it is … hot lava within the surface. There's no phreatic (steam-driven) eruption," Laguerta said. Alert Level 3 remains hoisted over Mayon. The danger zone has also been extended to a 7-kilometer radius of the volcano from 6 km. "With its present status, a possible violent magmatic eruption may happen … but we need to do more study that's why a team will be sent here to do more assessment," Laguerta said. Motorists were forced to switch on their vehicles' headlights to improve road visibility and avoid accidents following the ashfall. Camalig Mayor Ahrdail Baldo said residents were worried that lava and lahar flow would hit local communities, especially if heavy rain persisted. Though the local government has prepared for evacuation, Baldo said "I'm worried about food supply for evacuees if they will stay longer at evacuation centers, particularly if we run out of funds." The Albay Public Safety and Emergency Management Office is studying the possibility of putting up tents to accommodate more evacuees, according to its chief, Cedric Daep. Santo Domingo Mayor Herbie Aquas said at least 3,000 residents were evacuated from communities considered danger zones. Ligao Mayor Patricia Gonzalez-Alsua said 369 families were staying at a compound of a technical and vocational school in Nasisi village. In Guinobatan town, Mayor Ann Ongjoco suspended classes in all levels. A total of 3,784 people have been staying in four schools used as evacuation centers in Guinobatan. "Some residents here, especially the elders, are not afraid of the volcano anymore so they do not listen to us when we evacuate them," said Florentin Nares, village chief of Muladbucad Grande. "But when the alert level was raised to 3 [on Sunday night], I had them evacuated even in the middle of heavy rain," Nares said. The 2,460-meter Mayon, a tourist attraction in Albay because of its near-perfect cone shape, has a long history of deadly eruptions. An explosion in August 2006 did not kill anyone, but four months later, a typhoon unleashed an avalanche of volcanic mud from the slopes that claimed 1,000 lives.